Space technology is adopting plastics in spacecrafts, owing to its light weight and cost-efficient value, as well as being a hardliner against cosmic hazards, says Angelica Buan. The US is a trailblazer in space technology, having the world’s largest space programme. It has a hefty budget, too. For the current fiscal year, the US government is channelling an estimated US$18.5 billion to the National Aeronautics and Space Administration (NASA) to undertake its latest projects, which covers the Space Launch System, among others. These billion-dollar expeditions, however, don’t always get the green light. There are considerations like practicality and affordability that are crucial to space flight projects. Hence, light weight is a virtue for cost savings. The drift is that lighter crafts can have smaller, more efficient engines and less fuel. 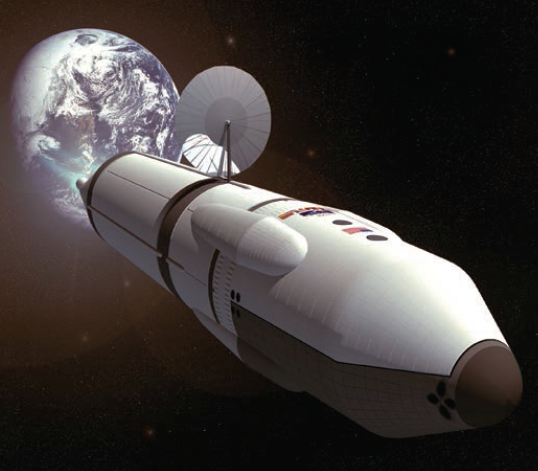 Aluminium has been favoured for space craft because it is light. Yet, space technology continues to seek new materials that can provide high performance properties while reducing the weight and costs of building modern space crafts. Plastic, for now, is a right fit for these criteria on weight, cost and safety of space travel. Plastic bags, which are being banned in many countries, hold a key for safer intergalactic space missions! The vital resin used to make most plastic bags and containers, polyethylene (PE), is the basis of space crafts to provide space crew with a better shielding from cosmic radiation, than aluminium space crafts would. NASA scientists have invented a PE-based material called RXF1 that is claimed to be three times stronger, yet more than twice lighter, as well as 50% and 15% more effective as a barrier against solar flares and cosmic rays, respectively, compared to aluminium. Nasser Barghouty, Project Scientist for NASA's Space Radiation Shielding Project at the Marshall Space Flight Centre, says that plastic-like materials produce far less "secondary radiation" than heavier materials like aluminium or lead. Secondary radiation comes from the shielding material itself, and is worse for astronauts’ health than space radiation. Particles from space radiation, as they collide into atoms within the shield, trigger tiny nuclear reactions that produce a shower of nuclear by-products, neutrons and other particles that enter the spacecraft. Heavier elements like lead produce much more secondary radiation than lighter elements like carbon and hydrogen. PE is composed entirely of lightweight carbon and hydrogen atoms, which thus minimises secondary radiation. Shielding project researcher Raj Kaul states that RXF1 is a ballistic shield that can deflect micrometeorites; and since it is a fabric, it can be draped around moulds and shaped into specific spacecraft components. Currently, further work and research are on-going to make the material flame and temperature-resistant. Meanwhile, the scientists do not guarantee that the material is 100% impenetrable, especially since some galactic cosmic rays are so energetic and no amount of shielding can stop them. However, their initial studies suggest that RXF1 could provide adequate shielding for a 30-month mission to the planet Mars. Space-trotters will welcome the idea of travelling light, but in consideration of safety, they cannot do away with equipment that is required to protect them from radiation. A space traveller's trek to Mars means being exposed to radiation. The planet does not have a strong global magnetic field to deflect radiation particles. Moreover, its atmospheric blanket is 140 times thinner than that of Earth. Evaluating a solution to the weight issue, Sheila Thibeault, a scientist at Langley Research Centre (LARC) who specialises in radiation shielding, said that there are elements on Mars that could potentially be utilised to create radiation-shielding materials on-site. In this way, astronauts need not lug too much equipment and building material in space. One possible solution is "Mars bricks”, or radiation-resistant bricks, which could be produced from materials available locally on the planet and used to build shelters. 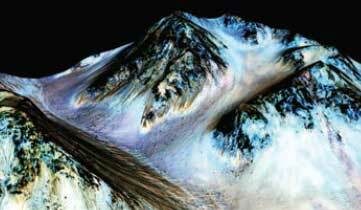 Thibeault explained that astronauts, for example, could mix the sand-like regolith, or topsoil found on Mars, with a polymer made on-site from carbon dioxide and water, which are both abundantly available on the planet. Zapping this mixture with microwaves creates plastic-looking bricks that double as good radiation shielding. Working with Thibeault on the bricks are chemists Ryan McGlothlin and Richard Kiefer, from the Virginia–based College of William and Mary. At a NASA laboratory, the scientists experimented on different concentrations of PE mixed with earth-sourced regolith and created small bricks that were then ovendried. Refining the bricks for building shelters to enable extended stays on the planet is a milestone for NASA, which hopes to shuttle people to Mars in the coming decades. It is not only radiation that can harm astronauts. The chemicals that run through the pipelines inside the spacecraft to make it habitable could also be hazardous. NASA developed a supersensitive sensor that mimics a mammalian nose to “smell” leaks or spills of analytes (chemical species) on board space stations. Called a JPL Electronic Nose or ENose, the autonomous device, which requires minimal crew interfacing, monitors the quality of the recycled air in the space station by continuously sampling air and documenting events where potentially trained-for chemical substances have been released. By training, it means that the sensors are exposed to the target analytes under various conditions. Data from that training is used to construct the data library. The ENose can also sense when an electrical fire breaks out through the increasing heat that releases a variety of signature molecules. Since it is thus, the ENose “fills the long-standing gap between on-board alarms and complex analytical instruments“, according to NASA. The developers explained that while the device can detect the presence of a small group of chemicals, which could be dangerous if they are present in the air, it is not designed to analyse everything in the air. A PDA, laptop computer or interface unit are used to record and analyse data in real-time. 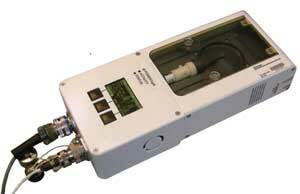 The sensor unit consists of an anodised aluminium chassis, which houses the sensor array and pneumatic system. It also contains the electronics to route power, relay data and commands between the sensor array and the ENose interface unit. For it to work, the ENose uses an array of 16 different polymer films, which are designed to conduct electricity. When a substance is absorbed into these films, the films expand slightly, and that changes how much electricity they conduct. Each of these films reacts differently to each substance or analyte. Some of the polymers used for the ENose sensors include nylon, PE, PVC, and polyvinyl alcohol (PVA). NASA selected polymers that respond to targets and make them conductive by adding carbon, thus ensuring that the sensors have a longer lifespan. The first generation JPL ENose flew on the Space Shuttle STS-95 in 1998. Development of the third generation device is underway, NASA said. It is being made especially for use in the International Space Station (ISS). It has the same basic sensor design as the first generation but the developers have found ways to make the polymers more sensitive than the ones used in the earlier model. When the Cassini spacecraft, launched in October 1997, embarked on a seven-year Cassini-Huygens mission to the ringed planet Saturn, it not only uncovered two new moons, Methone and Pallene, but also discovered a chemical on Saturn’s largest moon, Titan, that is used in plastics for packaging and household applications here on Earth. 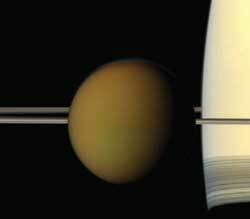 Cassini detected a small amount of the monomer propylene, which is used to make PP, in Titan's lower atmosphere through the Composite Infrared Spectrometer (CIRS). This instrument measures the infrared light, or heat radiation, emitted from Saturn and its moons in much the same way our hands feel the warmth of a fire. NASA's Voyager 1 spacecraft, which made the firstever close flyby of Titan in 1980, was able to identify many of the gases in the moon’s hazy brownish atmosphere as hydrocarbons, the chemicals that primarily make up petroleum and other fossil fuels found on Earth. Voyager detected all of the one and two-carbon families in Titan's atmosphere. From the three-carbon family, the spacecraft found propane, the heaviest member, and propyne, one of the lightest members. But the middle chemicals, one of which is propylene, remained elusive. As researchers continued to discover more chemicals in Titan's atmosphere using ground and space-based instruments, propylene was finally found as a result of more detailed analysis of the CIRS data, leading to a Eureka moment! Thus, this opens up a whole new horizon for plastic materials in space.